Community-acquired pneumonia in children can be identified as the infection and inflammation of the lung parenchyma and alveoli in a child who is not admitted to a hospital or any other health-care provider institution, or was admitted to a hospital in the last two weeks. The distinction between community-acquired and hospital-acquired pneumonia is very important, especially in children because the etiologies are very different. Accordingly, the empirical treatment of community-acquired pneumonia is different from hospital-acquired pneumonia. The incidence of community-acquired pneumonia in children is estimated to be around 55.9 per 1,000 in children younger than 5 years of age. In another recent Canadian epidemiological study, 41,000 children were diagnosed with community-acquired pneumonia annually; therefore, community-acquired pneumonia in children is a common condition that has a huge burden on the health-care system. The etiologies of community-acquired pneumonia are largely dependent and can be predicted by the child’s age. For instance, children who are younger than three months who develop pneumonia are usually infected with group B streptococci or gram-negative bacilli.
. Chlamydia infection is also common in the first three months of life. Newborns that are affected by chlamydia might develop afebrile pneumonia. Another important difference in the etiology of pneumonia between young children and older ones is the finding that the most common etiology of pneumonia in children younger than two years of age is, in fact, viral. Different viruses can cause community-acquired pneumonia in this age group. 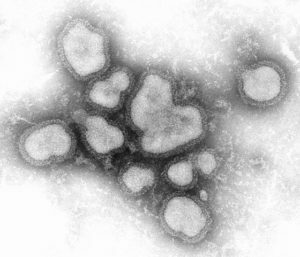 Examples include the respiratory syncytial virus, parainfluenza virus, influenza virus, adenovirus and rhinoviruses. Children aged between 2 years and 15 years might develop bacterial pneumonia. The most commonly identified organisms are streptococcus pneumoniae, mycoplasma pneumoniae and chlamydia pneumoniae. The most common etiology of pneumonia in this age group remains viral in origin, but streptococcus pneumoniae rank as the second most common cause. The next bacterial etiology in these children would be mycoplasma pneumoniae. Adolescents who develop pneumonia most likely have mycoplasma pneumoniae. 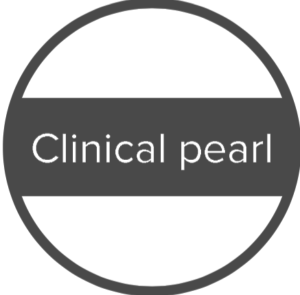 Therefore, it becomes clear that the age of the patient can help the treating physician in predicting the most likely causative organism, guide us in selecting the appropriate diagnostic tests and direct our management plans. Similar to the etiologies, the semiology of pneumonia in children is also age-dependent. Neonates and very young infants usually present with hypotonia, lethargy, fever and poor feeding. They can also develop hypotension and respiratory distress or apnea. Older children present with more specific symptoms that might include dyspnea, tachypnea, and hypoxia. They might develop respiratory failure and need ventilatory support. Physical examination is helpful in establishing the diagnosis of pneumonia in children. The diagnostic criterion consists of a cough and tachypnea. Tachypnea has different definitions according to the child’s age. Tachypnea in children younger than 2 months is defined as a respiratory rate > 60 breaths/min, in children aged between 2 months and 1 year is a breath rate above 50 breaths per minute and, finally, children between 1 year and 5 years should have a respiratory rate that is above 40 breaths per minute. Patients with chlamydia pneumonia are more likely to present with symptoms consistent with pneumonia, but without a fever. They can also develop conjunctivitis. The distinction between bacterial and viral pneumonia, based on clinical features, is usually difficult, but might be possible. Patients with bacterial pneumonia usually have an abrupt onset of their symptoms, develop a high fever and can have chills. The child is usually more toxic, might have decreased breath sounds on auscultation of the chest and crackles can be heard. 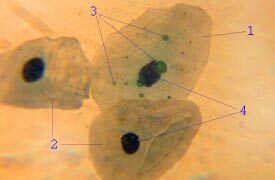 The picture in atypical pneumonia that is caused by mycoplasma pneumoniae is quite different. Children with mycoplasma pneumoniae develop their symptoms more gradually and are usually afebrile. They are less toxic and, when a chest X-ray is performed, the chest X-ray findings are usually very severe and inconsistent with the semiology. Children presenting with a cough and tachypnea should be evaluated for possible pneumonia, especially if they are febrile and have an acute worsening of the condition. The first diagnostic test is a chest X-ray. 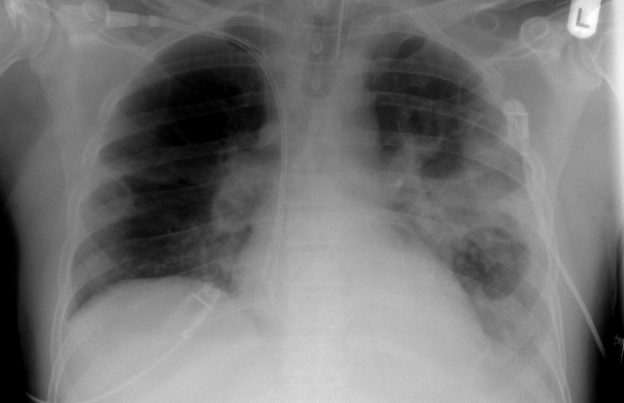 Chest X-rays might show lobar pneumonia or a diffuse lung infiltrate. Diffuse lung infiltrates are more common in atypical pneumonia. Follow-up chest X-rays are not indicated unless the patient develops a worsening of their condition. A follow-up chest X-ray might be indicated in that scenario to exclude possible pneumonia complications, such as pleural effusions or lung abscess. More specific tests to identify the causative organism are usually not indicated in children who are not immunocompromised and who appear to be well and able to eat and drink. Polymerase chain reaction tests to identify the DNA of the most common causative organisms streptococcus pneumoniae, mycoplasma pneumoniae and chlamydia pneumoniae are available. These tests can help confirm the presence of a certain organism, but are usually useless in identifying antibiotic resistance profiles. Sputum or blood cultures might be useful in identifying the antibiotic resistance profile in patients who do not respond to empirical antibiotic therapy. While complete blood counts are not helpful, they usually show leukocytosis. C-reactive protein, a marker of inflammation, is usually elevated. CXR in a well-appearing infant increases the risk of unnecessary antibiotics and does not distinguish between bacterial and viral disease. WBC count on CBC does not distinguish between viral and bacterial disease. Viral swabbing of the nose has a high false-positive rate. The first step in the management of a child with community-acquired pneumonia is to decide whether the child needs to be admitted for inpatient care or not. Children who are not toxic, not severely dehydrated, have a stable oxygenation status, and can take oral medication can be treated outside the hospital. Because the etiologies differ according to age, empirical therapies differ as well. Children aged between 1 and 3 months should be admitted and should receive erythromycin. Patients with afebrile pneumonitis due to mycoplasma or chlamydia should receive cefuroxime in an inpatient setting. Children aged between 3 months and 5 years can be treated in an outpatient setting if they are able to take oral medicine and are not very sick. Amoxicillin is the antibiotic of choice in this age group. Children who are allergic to penicillin should receive erythromycin instead. Children in this age group, who are hypoxic, dehydrated or severely toxic, should be admitted to hospital. The antibiotics of choice for inpatient care include ampicillin or cefuroxime. Older children between 5 years and 18 years should receive erythromycin or any other macrolide as first line therapy for outpatient treatment. If they need to be admitted to hospital, erythromycin with or without cefuroxime is indicated. Pneumococcal vaccination has decreased the incidence of streptococcus pneumoniae significantly since its introduction; therefore, it is recommended to receive this vaccination as one form of primary prevention of pneumonia in children. Davies HD. Community-acquired pneumonia in children. Paediatrics & Child Health. 2003;8(10):616-619.